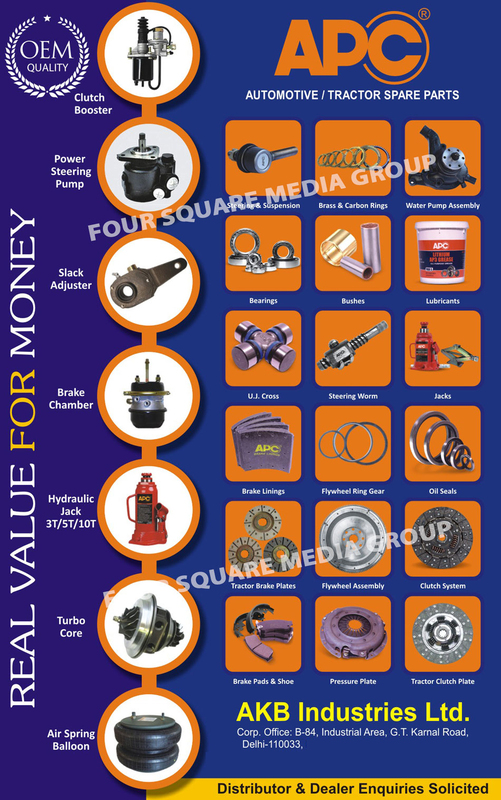 Automotive Spare Parts, Tractor Spare Parts, Clutch Boosters, Power Steering Pumps, Slack Adjusters, Brake Chambers, Hydraulic Jacks, Turbo Cores, Air Spring Baloons, Tractor Clutch Plates, Pressure Plates, Brake Pads, Brake Shoes, Clutch Systems, Flywheel Assembly, Tractor Brake Plates, Oil Seals, Flywheel Ring Gears, Brake Linings, Automotive Jacks, Steering Worms, UJ Cross, Universal Joint Crosses, Lubricants, Bushes, Automotive Bearings, Water Pump Assembly, Brass Rings, Carbon Rings, Steering Components, Suspension Components as an active Manufacturer, Supplier, Dealer, Distributor, Trader and Seller etc. (*Importer/Exporter/Service Provider). AKB Industries Ltd offers a wide range of auto parts ,Bearings ,Clutch plates ,lubricants ,Grease , Brake Linings ,UJ Cross, Oil Seals ,Brake Chamber ,Clutch Booster and other parts for TATA ,Leyland ,Maruti , Mahindra vehicles ,offering a complete solution , Oem quality and value for money to the clients with TQM ,great service and global presence.